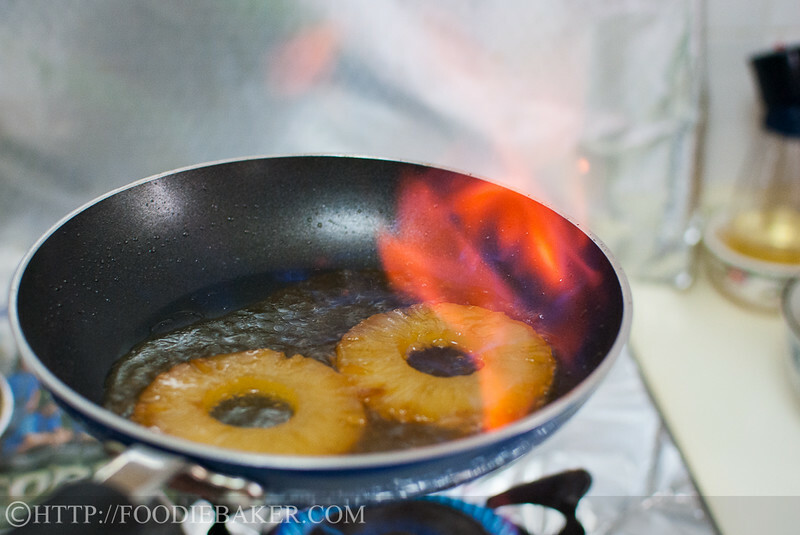 So… I had some leftover canned pineapple rings after using some to cook a pineapple chicken dish (the recipe ain’t very good so I’m not sharing it), and I’ve been wanting to make a foster for a really long time (been dying to set some pan on fire! 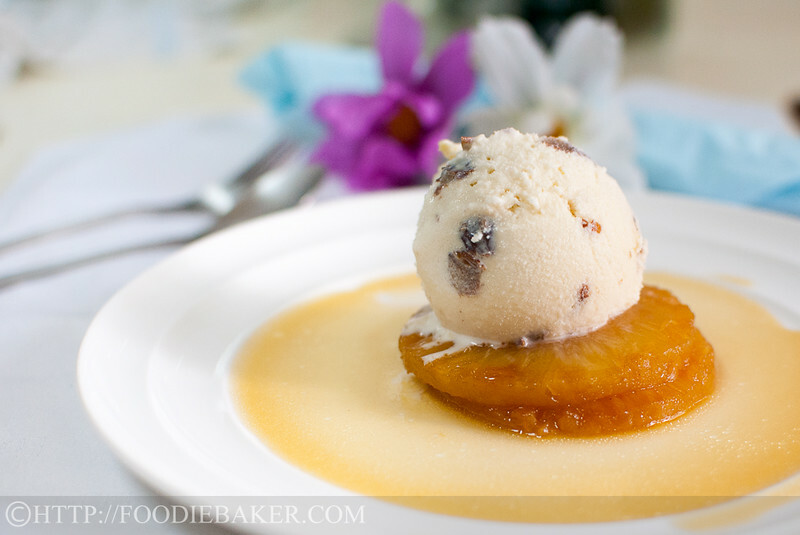 ), so I’ve decided to twist the popular Bananas Foster into a Pineapple version. And it’s really delicious and surprisingly easy too! 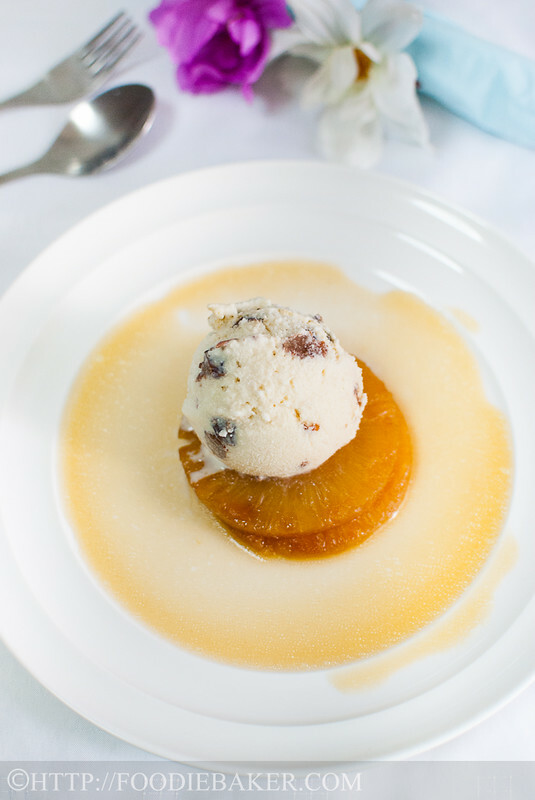 In case you are a food history nut like me: Bananas Foster was created by Paul Blangé at the Brennan’s Restaurant, and named after the owner’s (Owen Brennan) friend, Richard Foster. It is a dessert made by first cooking butter, brown sugar and cinnamon together, then bananas are added, followed by rum. The alcohol is then ignited and served with ice cream. The process of igniting alcohol is known as “flambé”, which means flamed in French. This process infuses the dish with aroma and flavour and take off some harshness from the high-proof spirits. Rum, cognac, cointreau and other flavoured liqueurs with about 40% alcohol content are suitable to be flambé. I found several pineapple versions, but none of them used canned pineapples and I wasn’t really in the mood to cook the butter and brown sugar together, but I was totally in the mood to set.some.fire learn how to flambé, so I decided to create a not-so-authentic but still delicious version. 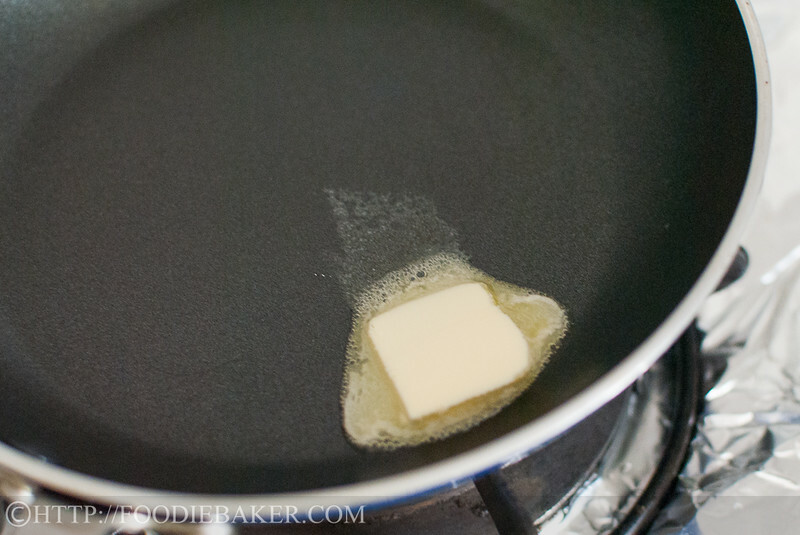 Melt some butter in a small, non-stick saucepan. 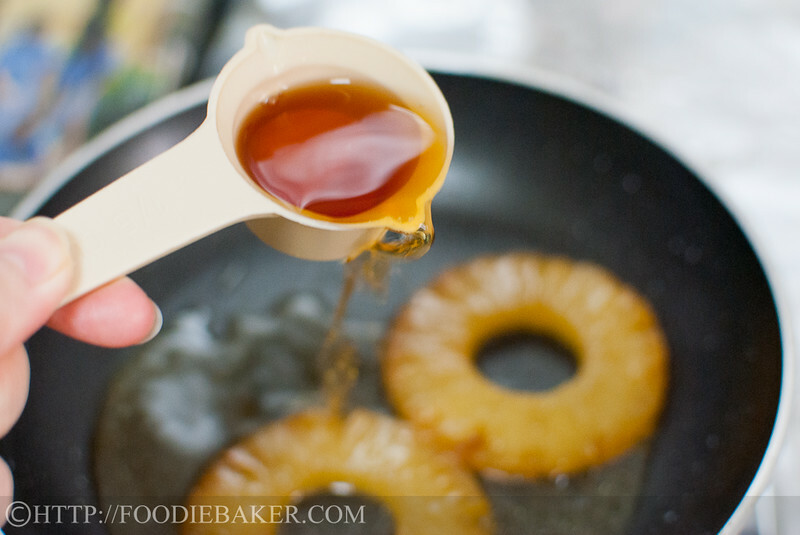 Place the pineapple rings in the melted butter and cook until both sides are starting to caramelize – the sides will browned and darken – don’t leave the pineapples unattended! You might end up burning them without realizing, keep checking them frequently so you don’t end up with slices of burnt pineapple. Of course, you can use more pineapples – I definitely would in the future! In fact, I actually wanted to stack a lot of pineapple rings together and top with a scoop of ice cream, but since I only had 2 pineapple rings left, well, I have to save the pineapple tower for the next time. Once the pineapples have turned nice and slightly caramelize-y, pour in some of the syrup used to soak the pineapples in and bring it to a boil and reduce it a little. It’s a really intense, sweet dessert, and definitely not for those watching their sugar intake, but… once in a while won’t hurt, right? Take the pan off the heat and add in the rum. Here’s where the fun is coming! But before that, if you are the first time doing it, stay very cool, calm and collected. You will probably get really excited, like me! Hover the pan over the fire, swirling the pan. Tilt the pan slightly forward towards the flame (but without the sauce pouring out) and the alcohol should catch fire almost immediately! My eyes widened and my mouth opened into a big “O” as I watched the flames danced in front of me – then I realized I need to take a photo. It wasn’t as difficult as I thought it would be! 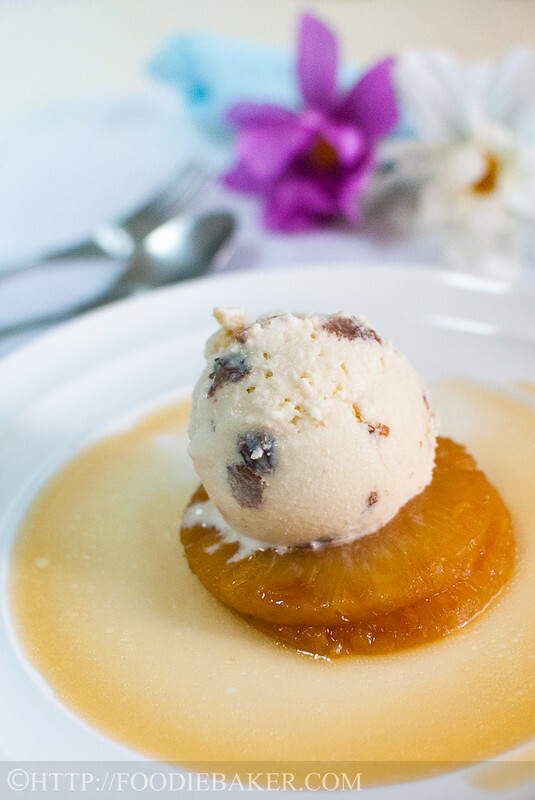 Spoon the pineapple and the sauce out and serve with a scoop of ice cream – I didn’t have vanilla so I used rum and raisin – double alcohol boost! My sauce is pretty thin and not as dark in colour as compared to the sauce made using butter and brown sugar – but hey, this is a cheat so there’s bound to be differences. Now that I have learned how to do a flambéing, I’m really looking forward to make the original Bananas Foster or the popular Crepes Suzette! Melt the butter in a small, non-stick, long-handled saucepan over medium heat. 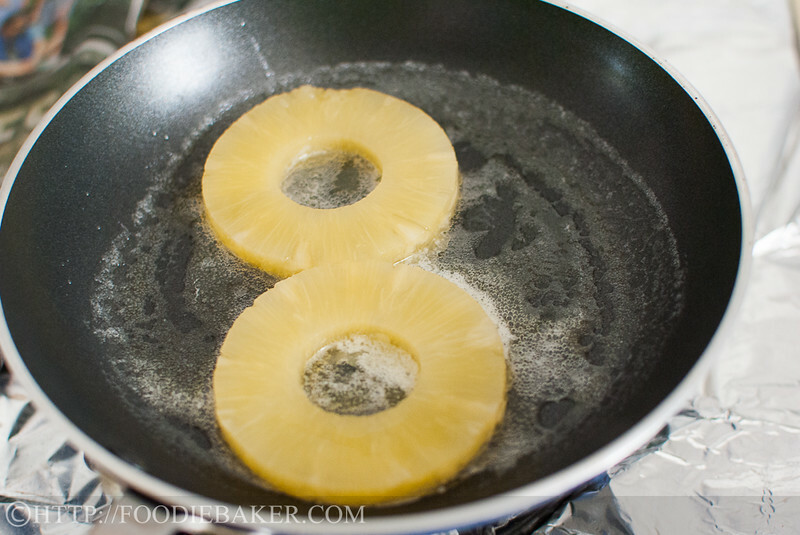 Add in the pineapple rings and cook over medium heat until both sides have darkened and the edges are starting to caramelize. Add in the pineapple syrup and cinnamon, if using, and bring to a boil. Lower the heat, simmer and reduce the syrup until about ½ to ⅔'s left. Remove the saucepan from heat. Pour in the dark rum. Method 1: Hover the saucepan over medium heat and swirl the saucepan to evenly distribute the alcohol. Tilt the saucepan forward slightly towards the flame (without spilling the sauce out) and ignite the alcohol. Swirl the saucepan gently and constantly until the flame goes out. Method 2: Lit a really long matchstick (like satay stick). Place the flame on the surface of the sauce and the alcohol should ignite. Swirl the saucepan gently and constantly until the flame goes out. Return the saucepan over medium heat to warm up the sauce if needed. 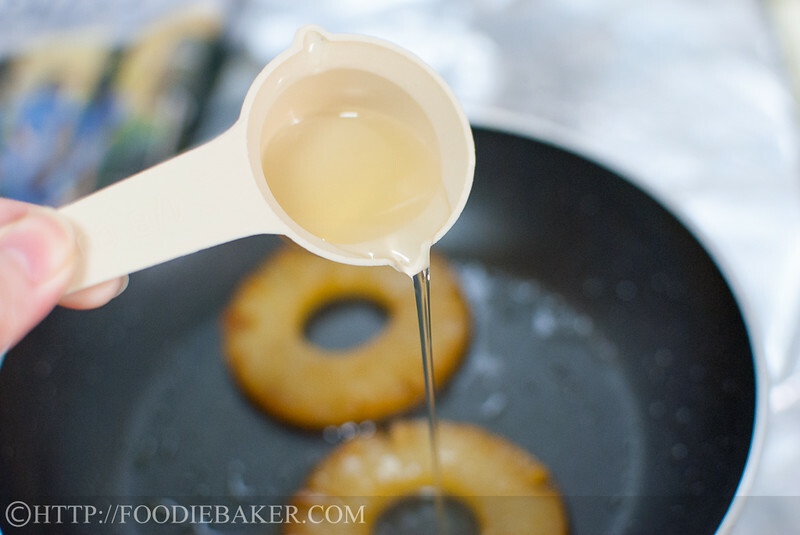 Spoon the pineapple rings and sauce onto a serving dish. Scoop the ice cream on top of the rings and serve immediately. The syrup needs to be heated up before the alcohol is added in so that the alcohol will be warmed up as well. At room temperature, there will not be enough alcohol vapors to ignite. I also removed the saucepan from the fire before adding the alcohol so that there will not be any chance of the alcohol catching fire while it is being added. I know some of us are using electric stove, so I’ve also included another method on how to ignite the alcohol! Don’t be afraid to try this recipe – I’ve always thought that I won’t be able to do it, thought that this is only for the professional chefs and the very experienced cooks, but, with proper precaution and preparation, it can be really manageable and it will definitely wow your guests should you be able to do it! wow, looks so good! I once experienced the ‘flames” when I least expected it! Made something with alcohol (could not remember what it was! ), and the flames caught me by surprise, it lasted for a few seconds only and I was pretty excited, but there’s no one to share my joy of my first experience with “flames from the saucepan”!! I have always wanted to recreate that moment, but have completely forgotten about it, that is, until I’ve read your post! The caramelized pineapple just looks fantastic! Yum! You are so brave cooking this… Call me a chicken but I won’t dare. I realized you are very fast with your camera too capturing the right moment for your very-thorough description. To flambé is far easier than most people think. You just need to be more careful in a normal sized kitchen. I used to flambé whilst working in a restaurant years ago. Loved that part of it. I used to be make people jump so they would end up laughing! Your first flambé? Exciting stuff, eh? My first was under an unexpectedly low oven fan and the flash almost burned the lights in it. But, I kept my cool, grabbed the flaming sauté pan, and walked it to the center of my kitchen, away from all other overhead objects. I have to give you credit, Jasline, for getting so creative with those pineapple slices. “Pineapple Foster” would never have crossed my mind. Ever! They sure do look good as a pedestal for your ice cream. A wonderful creation! Well done. Hi Jasline , that look really scrumptious and refreshing. Wish I can have some now. 🙂 Beautiful click. I was holding the frying pan in one hand and the camera in the other haha. Luckily I still remembered to take a photo, otherwise all the flames would have been gone! 😉 Have a great week, Bobbi! Love it! I have never flambe’d anything, I am afraid of a fiery inferno in my kitchen. You make it sound approachable!! Love Banana’s Foster, and I think using the pineapple for this is really a great idea. Looks delicious!